Come and play the 5 new soccer fields in URBAN SOCCER in Angers! Football fans in Dunkerque will be excited! Racket sports fans will be able to test the padel at the Tennis Club de la Tronche with the opening of an outdoor field! A 100% French manufacture by EPS CONCEPT and a 100% French installation by our partner Tennis Daniel Roux! A very nice collaboration which, sure, will emulate in the region! Decathlon d’Englos has chosen to install its new basketball court! Limoges fans wil be happy! THE FIVE Limoges proposes 5 indoor soccer 5/5 pitches ! Achievements 100% EPS CONCEPT ! Come and discover the new activities proposed by COTENTINDOOR in Cherbourg: indoor football, padel and squash. New achievements 2017 at Fun Foot Ajaccio in Corsica ! 3 indoor football pitches have been set up bringing the number to 8. Padel at Tennis Club Baumette in Angers France ! 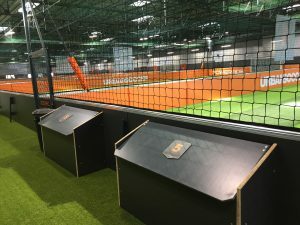 As part of the relocation of the Tennis Club de la Baumette and the creation of their new complex, 4 indoor padel courts have been manufactured and installed by EPS CONCEPT. Football at 5 and badminton at Vital Club in Savenay in France ! You knew padel and squash at the Vital Club of Savenay? Come and discover the new activities proposed by VITAL CLUB Savenay: indoor football and badminton.